Today is World Voice Day. It is a day that we celebrate the human voice in all of its forms and advocate for those who are professional voice users. This year I wanted to address a specific topic – the differences between classical singing and contemporary commercial singing (musical theatre, pop, rock, country, etc.) and the need for specialized training. My wife has recently encountered a local high school teacher and a local theatre director who have been trying to tell her students that they need to be singing classically instead of singing the music that THEY love to sing – musical theatre and pop. My response is why? Why should they be required to sing a musical style that they do not like and do not want to practice to learn how to sing something that they love and enjoy doing for fun? More importantly why should they learn to sing in a style that teaches them to develop muscle groups that are completely different than those required for singing contemporary music? If the student were enrolled in a university program, then there would be a valid argument for learning how to sing with a classical approach – the music written before 1969 was written before microphones became commonplace and required a strong acoustic vocal production. Those shows were written for singers with a classical background and studying that approach can be beneficial as part of a formalized training program. But if a student is only singing for fun or is singing a style other than musical theatre or classical, there is no reason that they MUST learn to sing classically first. The problem is when teachers such as myself make these claims, they often fail to back up their claims with literature from the scientific community. Let’s change that. Below I am posting links to articles that help shed light on this subject. If you are the copyright owner of any of this content and object to it being posted on this site, please let me know and it will be removed. The American Academy of Teachers of Singing is a highly selective group of the world’s finest voice teachers that is limited to forty members. They come from all backgrounds from classical to contemporary. In 2008 they issued a statement declaring that there are indeed major differences between the vocal production needed for classical and contemporary singing and that singers should be trained with a pedagogical approach specific to their own needs – Download Article Here. Many teachers avoid or refuse to teach belting because of their own experiences or perceptions. Classical voice teacher and former President of NATS, Dr. Scott McCoy, confronted his own beliefs and wrote about his experience observing an experienced belting teacher in the Journal of Singing. A summary of his observations – belting is not as loud or forceful as many believe. He also found that many of the belters were using a vocal fold closure (closed quotient) that was lower than that found in some classical singers! Download Article Here. Most people would agree that training a long distance runner with sprinting exercises would probably not be sufficient preparation for running a marathon. Why? Because you would be training a different set of muscles than required for marathon running. The same applies to singing. Classical singing requires a different laryngeal configuration than belting or mix belting. We know this because of multiple studies, one of my favorite can be found here (a more technical article can be found here). If you only train a student to use one muscular configuration and then expect them to get on stage and sing with another without additional training, you are setting them up for failure. So does that mean that all classical training is bad? No. The problem is there is no formalized protocol (beyond singing in Italian) that is universally recognized as “Classical Training.” That may shock some people but all you need to do is pick up one of several books and start reading to realize what I am saying is indeed accurate. Richard Miller wrote an entire book on the differences (and few similarities) between the English, German, French, and Italian approaches to classical singing training. In summary – they disagree with each other a lot (Read more here). You can also read Jerome Hines book “Great Singers on Great Singing.” In there you will find teachers who advocate techniques from breathing into your buttocks to not thinking about the breath. In Elizabeth Blades-Zeller’s book “A Spectrum of Voices” you will find teachers that advocate stabilizing the middle voice first when teaching registration, others that use a head voice down approach, and others that use breath slenderness to help balance registration. There are other teachers out there who study how the voice actually works and they use techniques that are specific to the needs of each individual singer. There are some teachers that are open minded and constantly exploring new techniques while there are others that believe there is no way but their own and will stick to their beliefs even when those beliefs are in complete opposition to commonly accepted research findings. Some “classical” teachers work really well for belters, a lot do not. I am fortunate to teach with colleagues who do excellent work with belters even though they come from different backgrounds including classical. However, these are teachers with years of experience teaching at an elite conservatory. I have not found that the same holds true for the majority of private studio teachers, many of whom have unfortunately been distanced from the newest research after leaving academia. So what should you do if you are a singer or a parent who encounters conflicting opinions from a theatre director or choir teacher? First of all, send them this blog post. Second, ask if they regularly read the Journal of Singing and Journal of Voice? If not, you should recommend that they do. If they are not reading, then it is quite possible that their assumptions are based on their own experiences and opinions and not scientific research. If that is indeed the case, then you should seek out the advice of a voice teacher with experience in contemporary sining styles. While the choir teacher or theatre director may be well intentioned, misinformation is still misinformation. Undertaking a training protocol that contradicts the needs of the performer can inhibit growth and potentially lead to vocal damage. 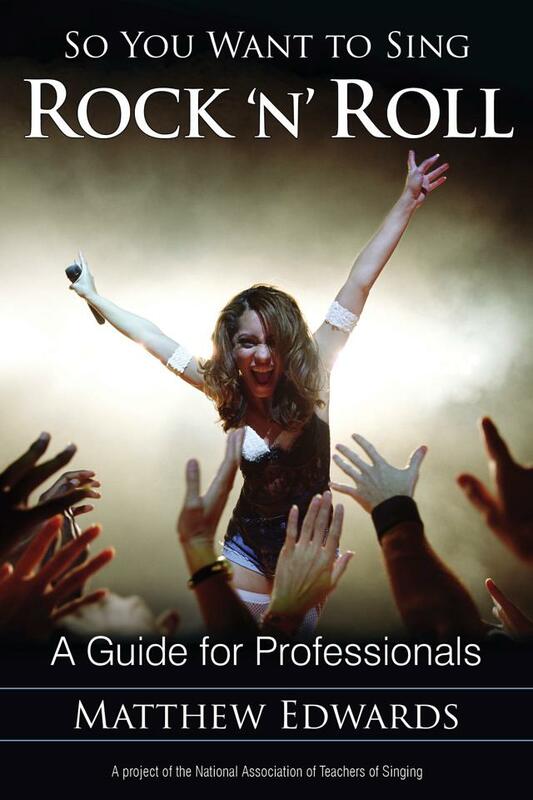 “So You Want To Sing Rock ‘N’ Roll?” Coming this summer from Rowman & Littlefield and the National Association of Teachers of Singing. My daughter is a natural belter. She has begun working on her classical voice in the past year with a teacher who has trained opera singers. Does she need another voice teacher to work with her on her belt voice? I would get her with a belt specialist just to make sure she’s doing it healthy. There are also stylistic differences that should be addressed.